Sure, who doesn’t love a Blizzard at Dairy Queen or a Concrete from Culver’s? Maybe toss some extra cake or whipped cream on or in there, what’s the harm? Apparently, quite a bit, according to Action On Sugar, a group based at Queen Mary University Of London in the U.K., which “conducted a survey of 140 drinks at UK fast-food chains and restaurants,” according to CNN. By surveying about 14 chains, the group found these foamy milkshakes contained “alarming” levels of sugar and calories. AOS wants these worst offenders to be labeled with a nutrition warning and possibly banned. By comparison, a medium Butterfinger Blizzard contains 730 calories, 25 grams of fat, and 80 grams of sugar (20 teaspoons). A regular Culver’s Chocolate Concrete with Reese’s contains 980 calories, 52 grams of fat, and 102 grams of sugar. So not as bad, but not great, really. 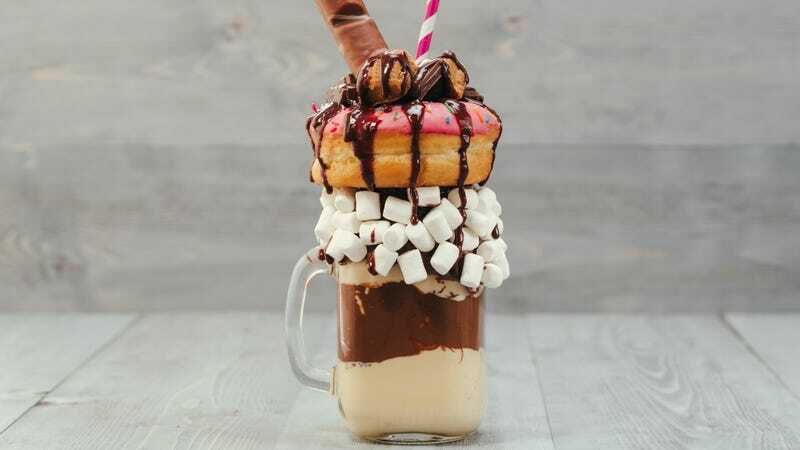 It seems like it would be possible for some of these chains to pare down their “freakshake” sugar ratio, as it’s hard to think of anyone who really needs all that extra sugar and calories. And although a spokesman from Toby Carver that “Freakshakes only feature on our main menu and are not targeted at children,” we bet it’s difficult for some kids not to be dazzled by all those sprinkles and whipped cream—stay strong, parents. Last Call: Who is jonesing for Target’s new Sugar Cookie Milk?